This figure first appeared on the Return Of The Jedi 77 back card but was also featured as a packed in the Tri-Logo Combate Ewok (Ewok Assault Catapult) set. Comments: If ever there was a reason to read the Return Of The Jedi novel, it would be all the cool bits about Teebo (and his chum Paploo). Even though the film leads one to believe that this is a figure of a background character, nothing could be further from the truth. Granted, one would have to put aside their views on Ewoks all together to fully appreciate this portion of the book, they would find it hard justifying their discontent for these characters after doing so. In the case of our gray friend here, he was actually a very well respected member of the tribe and played a major part in our heroes' fate. So stop reading this, and -uh-- read that. Major Variations: Though all vintage figures have minor variations, the Teebo action figure has only one major variation. This figure was moulded in both light and dark gray plastics. Based on all known examples, the Dark Gray Teebo was only produced in Taiwan. To date all Taiwan produced Teebo figures are dark gray. Interestingly, to contrast the dark plastic used in the mould, the spray ops on this figure are considerably lighter than those found on any of the Light Gray Teebo figures. There is a very curious variation in the Teebo Headgear accessory that may lead to another, yet undocumented figure variation. The standard version of this accessory (in the image below moulded with the number 3) features a completely smooth interior; where the other version (pictured here moulded with the number 5) has a small peg in the front interior. Based on designs seen in other toy lines, these sorts of pegs are meant to fit into a moulded hole on the figure to keep an accessory in place. It is still unknown however if there was ever a Teebo figure produced featuring the moulded hole for this purpose. 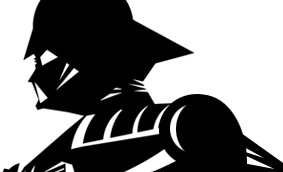 It is entirely possible that the peg was added or removed from the mould without the figure altered. 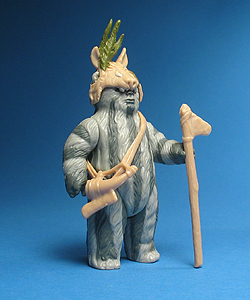 Though minor, it is interesting to note that the Stone Axe and Ewok Battle Horn accessories packed with the Teebo figure were moulded in both matte and gloss plastic. Both versions appear to have been based on the same sculpt. Neither should be considered more rare than the other.